New Telescopic Aluminium Extendable Multipurpose Heavy Duty Ladder With StabilizerManufactured to EN131 standard having 150kg weight capacity.Tradesmen and DIY people's choice. Length 4.1m (when fully extended) . Stabilizator width 67cm. Weight - 11.6kgEasy and safe to use locking mechanismSuperior quality and stability This Telescopic Ladder has many applications both work and around the house. Due to its unique design the ladder opens and closes "step by step", meaning that it can be used at multiple heights up to 4.1m. Therefore You open only to the height required giving great maneuverability, particularly in small spaces. The ladder is extremely compact in storage and transport taking aprox. space of (97cm x 48cm x 10 cm when folded). 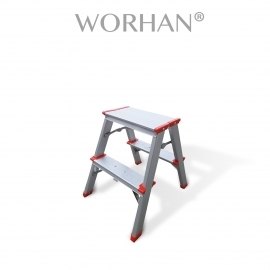 Manufactured as per European safety standard EN131 with weight capacity up to 150kg. These highly durable ladders were manufactured using high quality aluminium combined with new technologies and thus creating a heavy duty piece of equipment providing stability in the work environment. They will purposely serve in private and trade sectors. Ability to amend working length or height swiftly makes them also ideal to use when, cleaning windows, interior or exterior painting and decorating etc. Heavy duty rubber pads provide superior resistance to wear and ensures solid grip with working surfaces leaving no scratches. Stabilizer adds extra safety and rigidity when ladder is in use.